The car that McLaren are quietly optimistic about to lead them back up the grid will be unveiled on Valentine's Day, 2019. It will in all likelihood be papaya orange, a look that made it one of the best looking cars in the paddock last year. The British team also announced that it will be named MCL34. Shortly after the news was made public, the hashtag #McLarentinesDay was also introduced by McLaren's Twitter handle for promotional purposes. It has been six barren, frustrating and excruciatingly long years since McLaren won a race in Formula 1. When Jenson Button took the chequered flag in Interlagos, Brazil in 2012, nobody in their wildest dreams would have guessed the mountain of trouble they would have to go through just to be mildly competitive. After the Honda experiment brought only nightmares and heartbreaks, McLaren finally split and took on Renault engines last year. Having identified the fundamental issues with MCL33, this year's car should get them into a better position to compete. 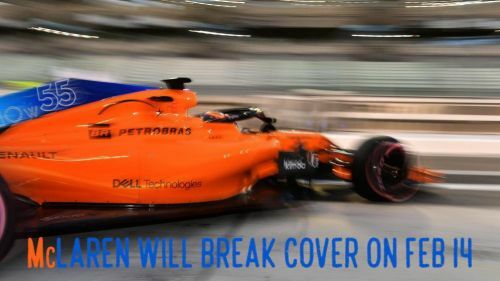 They will have a brand new driver line-up for 2019 in Spaniard Carlos Sainz Jr. and rookie Lando Norris - who was quick with a cheeky post himself. CEO Zak Brown has made a raft of changes at the McLaren Technology Centre in Woking and the team that has won 8 constructor champions in F1 history looks set for a fresh start. McLaren last won the team title way back in 1998. With McLaren's announcement, there are now car launches on 3 consecutive days in February starting with Racing Point on the 13th and Ferrari on the 15th. McLaren will also be competing this year in the Indianapolis 500, but would expect their second year of partnership with Renault to bring better results.